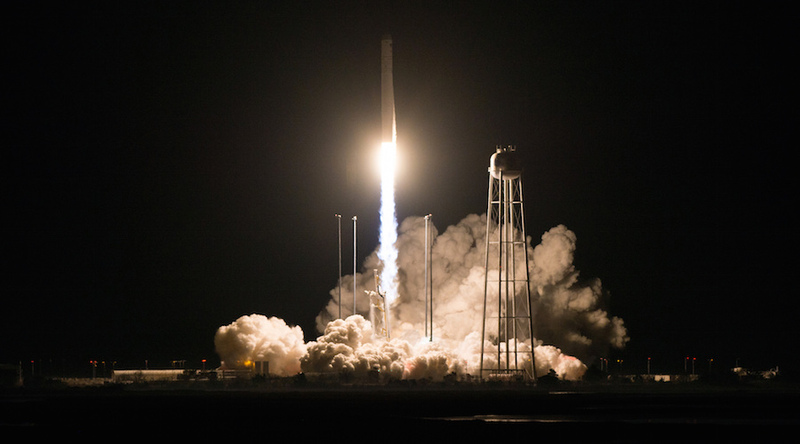 The unpiloted commercial cargo ship rode the 139-foot-tall (42.5-meter) Antares rocket away from the Mid-Atlantic Regional Spaceport, a facility owned by the state of Virginia on the Atlantic coastline at Wallops Island. The Antares rocket’s first stage, with fuel tanks built in Ukraine and Russian-made RD-181 engines, propelled the launcher into a clear predawn sky with 864,000 pounds of thrust. The Antares guidance computer commanded the engines to gently pivot, steering the rocket toward the southeast over the Atlantic Ocean to align with the space station’s pathway. Three-and-a-half minutes into the flight, the first stage shut down and separated, leaving the Antares upper stage — powered by a solid-fueled U.S.-built Castor 30XL rocket motor — to finish the job of accelerating the Cygnus supply ship into orbit. The Cygnus spacecraft separated from the Antares upper stage around nine minutes after liftoff, arriving in an on-target preliminary orbit to begin a two-day chase of the space station, culminating in its capture by the lab’s robotic arm at 5:20 a.m. EST (1020 GMT) Monday. 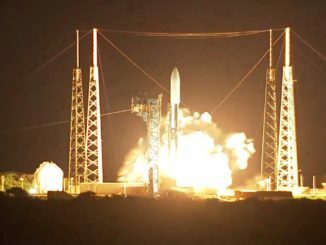 “Not only was it a beautiful launch this morning, it put Cygnus exactly where we wanted it in orbit,” said Frank DeMauro, vice president of advanced programs at Northrop Grumman Innovation Systems, which developed and owns the Antares rocket and Cygnus spacecraft. “The spacecraft, after separation, we were able to communicate (with it) extremely quickly and start conditioning. We initialized the guidance system and the propulsion system. That all checked out really well. “Then we began the process of deploying the solar arrays, which I’m happy to report have been successfully deployed and are generating lots and lots of power, so the spacecraft is extremely healthy and is ready to begin its trek to the ISS,” DeMauro told reporters after launch. The Cygnus spacecraft joined a Russian Progress resupply freighter in orbit following its launch Friday from Kazakhstan. The Progress cargo capsule is due to arrive at the space station with a docking around 2:30 p.m. EST (1930 GMT) Sunday, followed by the capture of Cygnus with the station’s robotic arm Monday. The Antares launch in Virginia was delayed two days by rainy weather. 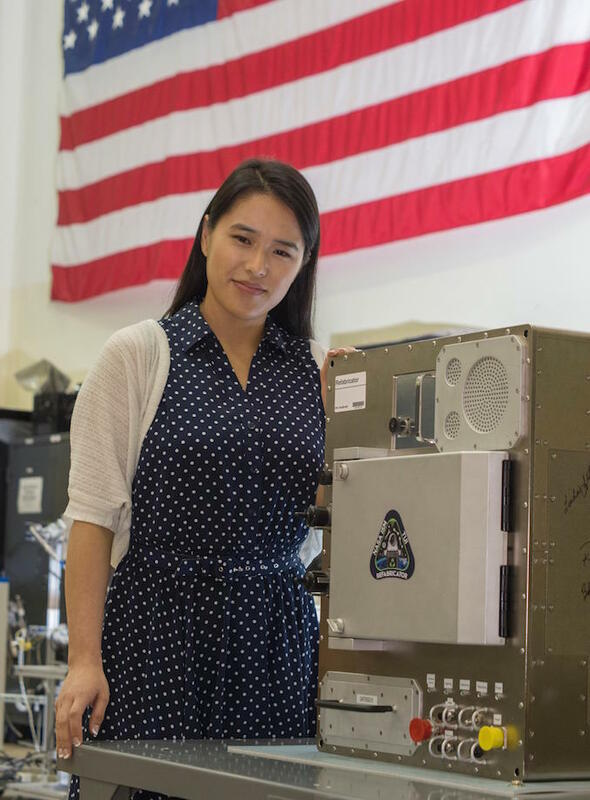 NASA astronaut Serena Auñón-Chancellor will be at the controls of the station’s Canadian-built robotic arm to snag the Cygnus cargo craft Monday. She is joined by European Space Agency commander Alexander Gerst and Russian cosmonaut Sergey Prokopyev on the orbiting outpost 250 miles (400 kilometers) above Earth. Two additional crew members were supposed to be on the station, but their launch was aborted two minutes after liftoff Oct. 11 aboard a Soyuz rocket from Kazakhstan. Soyuz commander Alexey Ovchinin and NASA astronaut Nick Hague safely landed downrange after the launch emergency. The accident left the station with a three-person crew for weeks longer than anticipated, until three fresh crew members launch on another Soyuz flight Dec. 3. Gerst and company will depart the station in their Soyuz landing craft Dec. 20, leaving the three newly-arrived residents in orbit until another Soyuz crew arrives in the spring. The Cygnus supply ship — flying on the NG-10 cargo mission — is set to deliver 7,215 pounds (3,273 kilograms) of supplies and experiments to the space station, including a plastic recycler and 3D printer built to advance in-space manufacturing capabilities, and an experiment studying how the human body’s ability to perceive motion, orientation and distance changes in microgravity. The Cygnus supply ship is expected to remain berthed at the International Space Station’s Unity module until mid-February, when it will be released by the station’s robotic arm. Managers also decided not to launch a secondary payload on the Antares rocket’s second stage. Around 60 “ThinSat” wafers, each about the size of a slice of bread, were to be deployed from the Antares rocket soon after arriving in orbit, well below the space station’s altitude, where they will quickly re-enter the atmosphere and burn up. 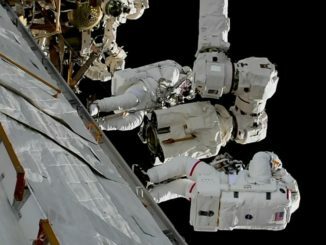 Using a standardized form factor, children from middle school age to university students integrated sensor and transmitter hardware on the ThinSats with the support of the Virginia Commercial Space Flight Authority, Twiggs Space Lab, Northrop Grumman, and NASA’s Wallops Flight Facility. The first ThinSats were supposed to fly on the NG-10 launch, but they will now launch on the next Antares mission in April. Officials agreed to remove the ThinSats from Saturday’s launch to ensure the tiny wafers do not pose a collision hazard with the Progress supply ship, according to Dale Nash, CEO of Virginia Space. 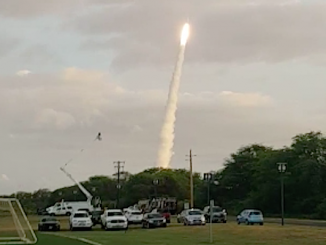 While there is no concern the ThinSats could be a threat to the space station itself, the Progress was orbiting around the same altitude the tiny chips were to be released. The Cygnus supply ship launched Saturday is named the S.S. John Young, in honor of the NASA astronaut who flew on six space missions — Gemini 3, Gemini 10, Apollo 10, Apollo 16, STS-1 and STS-9. Young was co-pilot on the first flight of NASA’s Gemini spacecraft in 1965, walked on the moon during Apollo 16 in 1972, and commanded the first space shuttle mission in 1981. He died in January. 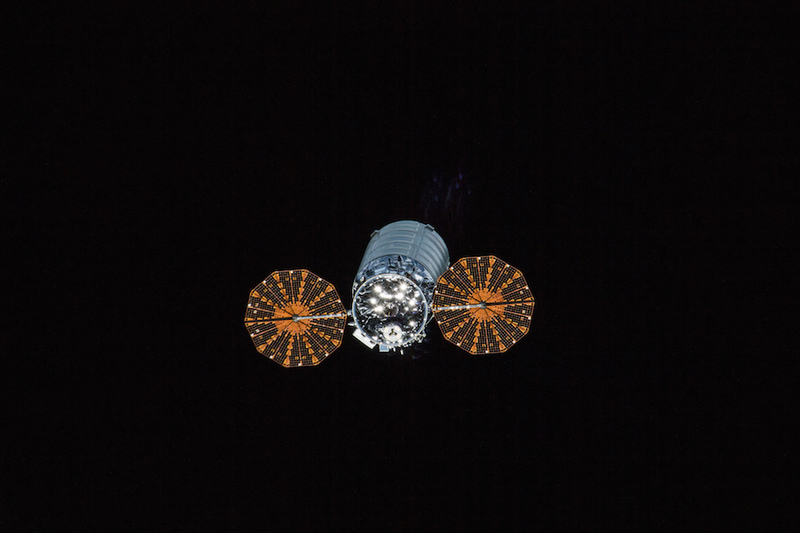 The unpiloted Cygnus cargo hauler is comprised of two modules — a service and propulsion module built by Northrop Grumman Innovation Systems in Dulles, Virginia, and a pressurized logistics module built by Thales Alenia Space in Turin, Italy. Cygnus is designed to re-enter the atmosphere over the Pacific Ocean at the end of its mission and burn up, disposing of the trash carried inside.